Earlier this month I had the opportunity to share about my experience of birdwatching in Korea with one of the local Audubon chapters, the Coastal Bend Audubon Society. This chapter has a strong interest in the conservation and restoration, and is made up of some well-informed and highly knowledgable local birdwatchers, ecologists, and ornithologists. 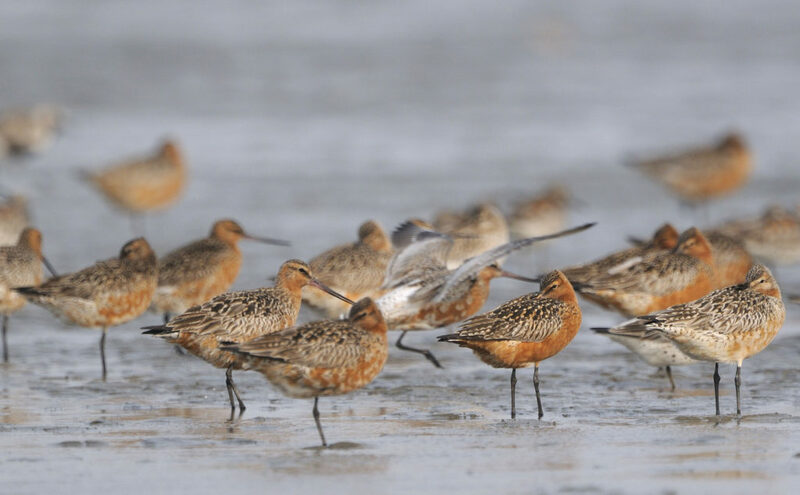 Many (perhaps all of whom I’ve met) of its members are conservation-minded, so I was given a good chance to share about some of the conservation issues bird species face in the Yellow Sea. I focused quite a bit on many of the fascinating migrants we are able to observe on passage in Korea, and about the different types of habitat they use. I shared with the audience some of the beautiful images that can be found on our blog and website, and talked about the great adventures I enjoyed with other Birds Koreans, during survey work, and on field trips. If you know me, you know I often get a bit lost in passion when talking about birds, especially when talking about birds of Korea. But I also presented about China and the DPRK, and about some of the great work that is being done in both nations. One audience member interestingly commented about his time in Korea many years ago, and how he and a local soldier observed Siberian Cranes near the DMZ. He said it was unforgettable and was impressed that the soldier knew about Siberian Cranes. I wonder how many records have gone unshared. Near the closing of the talk, I let the audience know that almost all of the many species we talked about and images shared were actually of threatened species. I then shared about the work of Birds Korea, work in Bohai and Yalu Jiang, and of course talked a lot about shorebirds and tidal flats. As I finished the presentation, I realized that many in the audience hadn’t yet heard about reclamation, or Saemangeum, or many of the other conservation issues of the Yellow Yea, so they appreciated the information shared. But it felt as if some must have left the meeting asking if there is something we can do to help. On my ride home, and for days after, I reflected upon the presentation. I thought about this region, the Texas Coastal Bend, and how it’s unique in that it is where tropical meets sub-tropical, and where two major flyways converge. So it’s also a hotspot for migratory birds. Because of this, there are a great and growing number of birders in the area. They make an impressive community, mostly because they are seemingly so active in not only birdwatching, but also improving habitat and understanding of birds and wildlife in the region. And they are keen to learn more about birds and conservation from other parts of the world. I realize there is a good opportunity to present and share more about Birds Korea’s work in the Yellow Sea. Perhaps with this, we can find ways to fundraise or gain more international membership for Birds Korea. Fundraising could then help pay for future survey work, office expenses, and also help to buy necessary birding equipment for future education programs through Birds Korea. With great hope, we shall see. I’m grateful for the chance to share with the Coastal Bend Audubon Society (thank you to David Newstead of CBBEP), and I’m looking forward to future events with the group and others within the community. Thank you!